First appearing in Darth Vader, Doctor Aphra quickly became a personal favorite of mine. In fact, along with Rey and Ahsoka Tano, I’d say she’s one of the most significant Star Wars characters to appear within the last ten years. Consequently, because she regularly stole the spotlight in Darth Vader and even Star Wars, Marvel gave the good doctor her own series. If you’re unfamiliar with Doctor Aphra, she is amoral, brilliant, and snarky as can be. An archaeologist by trade, Aphra is not bound by such things as decency and preserving life. She does what it takes, usually with a smile on her face. Make no mistake, though — she is not insane. She’s perhaps a sociopath, but of the really charming sort. The beginning of this volume, titled Aphra, gets us off to the perfect start. 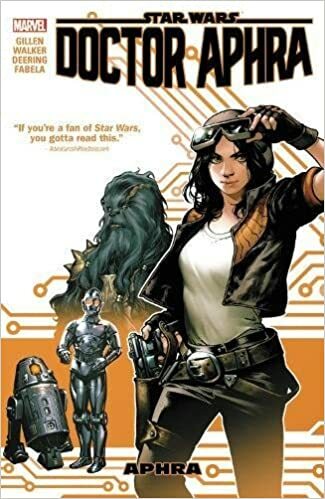 The first several pages succinctly establish Aphra’s character. We immediately meet her hilarious supporting cast: the murderous astromech droid designated BT-1, the protocol droid specializing in torture named Triple 0, and the seriously disgruntled Wookie called Black Krrsantan. Why does such a delinquent crew tolerate one another? You’ll have to read the book to find out. However, soon enough, Aphra became less enjoyable for me. I hesitated to write this review for a few weeks because I couldn’t quite put my finger on it, and then, last night, it hit me. Doctor Aphra had a really tragic father figure in Darth Vader. Their bond, though completely toxic, also had an element of fun in that you could tell, somewhere deep within their crooked souls, they actually cared for one another in a strange familial aspect. Since we know Darth Vader one day will actually live up to his role as a father, it proved ironically endearing to watch him with Aphra. I feel that Aprha takes a serious misstep when it introduces her actual birth father. After such a long story arc with Vader, it struck me as far too soon to put Aphra back in this role. Yes, she is clearly her father’s better and often puts him in his place, which was an interesting juxtaposition with what we’ve seen previously, but by the book’s end you realize she does care for her father, just as you realize Vader cared for her. In my mind, this plot would have worked far better further down the road after we got to see more of Doctor Aphra as character devoid of any paternal influence. In fact, I think Doctor Aphra shines best in Star Wars: Rebel Jail. In that volume, Aprha is mostly interacting with Princess Leia and Sana Starros (who also has great potential). These three women are all about the same age and have differing perspectives on life, priorities, and laws. It was an absolute blast to read their story when forced to work together. I’d hoped that we’d get more of that sort of thing with Doctor Aphra’s first solo outing. I really wanted to see her fully in charge of her adventure without, frankly, any sort of patriarchal influence. I will, of course, continue to read Doctor Aphra, by no means is this volume a deal-breaker. She’s an incredibly charismatic character who can fit into virtually any spot of the Star Wars universe, and I can’t wait to see her further cement her place in the vast mythology. I’m hooked. I had zero expectations for this book, but I knew it hooked me within the first five pages. Here’s the premise: The Four Horsemen have been reborn to ravage mankind yet again, only there’s one problem—there’s only three of them. The fourth, Death, did not die along their side to require a rebirth, and the other three don’t like that. Though reborn as children, they already plot Death’s decimation. Know, though, that this is not happening in our version of reality. In East of West, America is divided among seven nations due to events dating back to 1908. There is also a prevailing religious fervor within the population referred to as “The Message.” The time is “now,” but “now” seems to be a mixture of the old west and the far future. We soon meet Death, and Death seeks revenge. He travels with two witches, the Wolf and the Crow. The three of them are a formidable posse, and also three of the most visually interesting characters in comic books. Why does Death seek revenge? You’ll have to read the book to find out, but it involves his former Horsemen, a romance, and a child. Nick Dragotta provides exceptional artwork you have to see to believe. Let’s be honest: the graphic novel covers are rather boring. Trust me, though, the interior artwork is exquisite. Dragotta makes futuristic cities and barren desert landscapes equally interesting. But it’s the sense of movement that sets Dragotta apart. His battle scenes are clean, violent, and frenetic. He knows just the right angles, just the right times to open the panel up or draw it in tight. It’s a delight to look upon. You know I’m a color guy, so we can’t leave out Frank Martin. Death, the Wolf, and the Crow are almost entirely black or white, but even so, Martin makes them unbelievably dynamic. In the hands of the less talented, they would look washed out or bleed into the background, but Martin knows how to make them pop. Hickman has built a complicated world comprised of diverse mythology, cutthroat politics, maniacal religion, insane science fiction, all-out action, and some chilling horror. Somehow he blends it all together seamlessly, and the result is that must-read I so desperately craved. I saw this book earned a little buzz so I thought I’d check it out. The premise is Grant McKay and his team have broken through the barrier between infinite dimensions. The machine making this capable, The Pillar, got damaged though, so they only have a little time before they jump to another world, and if they want to make the jump, they better be near The Pillar or they will be left behind. McKay’s two children were sucked along for the ride, as were two corporate representatives who don’t get along with McKay at all. McKay is your narrator. He is anti-authoritarian, smug, arrogant, cheats on his wife, and is not all that likable. This first volume begins with McKay trying to escape some aliens and race back to The Pillar before the next jump. Over the course of the volume, you discover why his kids are with him, why his wife is not, why the team seems so ill prepared, the identity of his mistress, and why the two corporate representatives accompany them. The artwork is quite stunning. Scalera creates some impressive aliens and exquisite settings. His panels keep the story moving along wonderfully, and he delivers some dynamic, fast-paced action. My only complaint is that because McKay’s crew wear the same uniforms, they tend to look quite a bit alike. I appreciate the realism, because they likely would wear the same suits, but at times it’s hard to tell who is who. Dean White does the painted art, and let me tell you, his colors alone make this book worth the price. I have zero talent at colors, so I’ve learned to appreciate that which I cannot do. White is a master. Gorgeous colors. In the end, though, while the book is very good, I can’t say I’m hooked. I bought the first volume because I was sure I’d love it, but I didn’t. I’ll probably check out the second volume when it comes to a local library. I simply never connected to the characters. McKay is an anti-hero, and that isn’t a bad thing, but I never really cared about him. I never found any common ground. I never necessarily rooted for him. I can’t really say I have to know where his story goes next. Of course, this is just my opinion. I loved most of the art, the story proved interesting, the colors were beautiful, so there is a good chance you may very well adore it. If the premise captured your interest, I encourage you to see for yourself. I have loved comic books since the age of three. I still remember my first comic, an issue of World’s Finest featuring Batman and Superman. I still love comic books, but unfortunately have trouble finding appropriate ones to share with my six-year-old daughter. You see, even though I’m now thirty-seven, most Batman and Superman comic books are still written for me. Furthermore, the all-ages comic books released by Marvel and DC tend to be one slugfest after another. I’m not interested in my daughter reading that sort of thing. A few weeks back, I started hearing good things about a graphic novel series called Zita the Spacegirl. My daughter and I love making up space stories, so we headed to the local library and checked out the first volume. My daughter immediately loved it. I read it to her to double-check its appropriateness, and I’m pleased to say it’s a perfect match for what my daughter wants and for what I require. I won’t lie, I love the character as well. In fact, after we returned that first volume to the library, we bought all three volumes for her birthday. 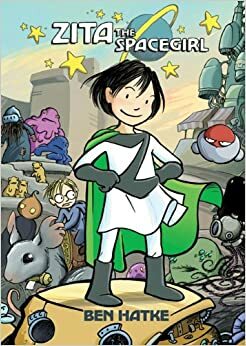 I love Zita the Spacegirl because while it’s appropriate for a six-year-old, it’s also full of action and real science fiction. There are aliens, spaceships, robots, and explosions. But there’s also a lot of positive messages in it as well, such as loyalty, doing the right thing, facing your fear, and self-reliance. Hatke’s art, by the way, is top-notch. Yes, it’s purposefully cartoonish, but I challenge you to find a more diverse and interesting collection of robots and aliens in any comic book. Furthermore, his sequential storytelling is perfect. My daughter has no trouble following the progression because of Hatke’s smooth transitions from panel to panel. Make no mistake, by the way, this book is one-step away from being a little scary. It never quite frightens my daughter, but some of the aliens are creepy, some of the story is pretty tense, and there are moments of real danger for our characters. Hatke knows a good story has to be appealing, and he’s made it so by getting as close to the line as he can without crossing over it. As a final boon, if you’re familiar with my writing you know I’m always searching on my daughter’s behalf for a female character that is not a male derivative (Supergirl) and that is also not in her underwear (Wonder Woman). In Zita, we have a girl not much older than my daughter who is tough, kind, smart, funny, brave, independent, and respectable. I’m so happy to have found a comic book that I feel good about sharing with my daughter. It’s been a long time since I read a graphic novel that excited me as much as Manifest Destiny. I’m going to say it now: this is a must-read book. The premise is outrageous. It follows Lewis and Clark’s expedition through the American frontier in 1804. But they are not only charged with charting the unknown by President Jefferson; they are also assigned to find and eradicate any dangers to the American people—dangers pertaining to that of cryptozoology. In this volume Lewis and Clark, as well as their crew of soldiers and paroled criminals, encounter a band of creatures similar to that of a Minotaur. However, it’s not quite a Minotaur, which brings about some much needed levity as Lewis and Clark try to designate it. There is also a plant that overtakes mammals and transforms them into something akin to zombies. The forest is overrun with it, and the men cannot let it continue to thrive no matter how much danger it may pose to the crew. I’m telling you, though, it’s written so well, with just enough humor, just enough gravitas, just enough believability, that you’ll find yourself completely immersed. The art, by the way, is absolutely stunning. Matthew Roberts is the rare talent who can draw people, clothing, nature, and monsters in the same style and make it all look detailed, dynamic, and downright pretty. Yes, his monsters are disgusting and scary, but artistically speaking, you can’t help but admire them as works of beauty. Roberts’ art is amplified by Owen Gieni’s gorgeous colors. All of this book takes place in the wilds of an untamed America, and Gieni found the perfect blend of earth tones to make each and every page pop. I read a lot of graphic novels, and I can honestly say (again) that this is the most excited I’ve been for a new series in years and years. If there’s any small part of you considering this book, go ahead and buy it now. You will not be disappointed. Oh, by the way, the breakout character of the book? A Sacagawea you do NOT want to cross. With art by 100 Bullets collaborator Eduardo Risso, Azzarello has created a bleak, unsettling landscape where the very rich are well taken care of, and the rest of us are left to survive by any means necessary. Spaceman follows the story of Orson, one of a group of genetically engineered astronauts meant to explore Mars. However, most of the story takes place in a flooded, ruined city that, like most of the coastal world, has been overwrought by melting glaciers. Long since returned to Earth after the demise of NASA, Orson is left to pirate and scavenge in order to endure. Soon, however, Orson finds himself in the middle of a kidnapping, one in which an orphan has been stolen from a reality television show’s super-couple, obviously modelled after Brad Pitt and Angelina Jolie. The couple are the stars of a show where orphans must compete to be adopted by the celebrities and live a life of leisure. Before long, Orson is at odds with the only other surviving member of his astronaut crew, Carter. His brother has taken a darker path in life, consequently, and he too becomes involved with the abduction. If the child is to survive, Orson must overcome hauntings from Mars that still disturb him as well as a very present cadre of killers. Perhaps it helped the book that I suffered from stomach flu while reading it, but the ruin and demise of the world depicted in its pages truly touched a nerve. Risso’s gritty, detailed artwork is a perfect match for the tale, and he portrays a horrifyingly civilization that may not be that far off. Quite honestly, I expected Spaceman to take place more in outer space. I was surprised that the majority of the book unfolded on Earth. I was further surprised that, at its core, the story presented a child kidnaping case. However, the story is far more than just that. I truly believe Azzarello to be an underestimated writer in today’s literary scene. His stories are often violent, alarming, and graphic, but they also touch on themes that apply to our modern life. For example, Azzarello realizes that we are ruining our environment and that repercussions await us all. Those repercussions are evident in Spaceman. He also has noticed that the poor seem to be getting poorer, while the rich get richer. Spaceman delivers a painfully realistic portrayal of what the current trend may yield. And though it’s a matter of much controversy, I find Azzarello’s commitment to language commendable in Spaceman. Like his rendition of society, he presents a language that is falling apart, shortened, and slowly dying. 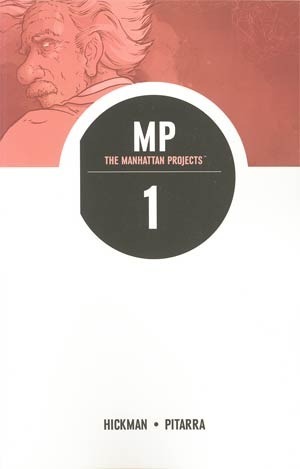 Azzarello clearly put a great deal of thought into his vision of our ruined language, and the dedication to his vision reminds me of writers such as Anthony Burgess. Spaceman is a potentially prophetic science fiction work that offers a troubling glimpse of our destiny. Azzarello grants us a violent adventure with the life of a child hanging in the balance, a societal warning, and a craftsmanship to be celebrated.